Snorkeling is fun but the experience can be marred by lack of clear underwater vision. I mean, what’s the point of trying to explore the exciting marine world without crystal clear vision? It’s even worse if you have eyesight problems and use contact lenses or prescription glasses. 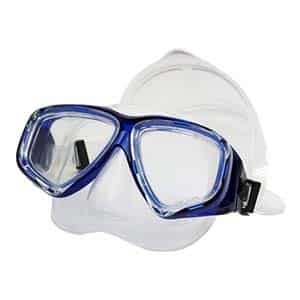 Fortunately, with the best prescription snorkel mask, you can enjoy your underwater exploits with vivid clarity. There is a wide range of snorkel masks integrated with prescription magnification on the market today. These prescription snorkel masks are designed for people with poor eyesight to achieve excellent visibility underwater. Why Buy a Prescription Snorkel Mask? How We Choose the Best prescription snorkel mask? You don’t need to have majored in science at school to know that objects look larger and appear closer underwater than on land. You’ve probably seen this when looking through a glass of water in your kitchen. Light actually behaves differently when passing through water. It’s called refraction. So even if you have perfect eyesight, your vision will no doubt be distorted underwater. If you are nearsighted or farsighted on land you’ll need a prescription mask to avoid a more blurry vision in water. But can you wear glasses while snorkeling? You could but it will not only be uncomfortable but your vision will be extremely blurred too. Lack of clear vision will even impede your body coordination while swimming underwater. You’ll need a prescription mask that adjusts your grade to the mask’s prescription lens to compensate not only for light refraction in water but the distance between your eyes and the mask lenses too. Snorkeling can be an exciting experience but only when you can see clearly underwater. If you are planning to go snorkeling while on vacation, you’ll want to explore the scenic aquatic environment, plants, and wildlife with perfect clarity. This won’t be an easy task using a regular snorkeling mask especially if you use prescription glasses or contact lenses in your day to day life. Diving should be fun and not limited to a blurry line of sight. Just because you are somewhat visually challenged does not mean that you shouldn’t enjoy the magnificent underwater beauty. Prescription dive masks ensure that you can enjoy the breathtaking marine life and even read the dive computer. So if you are planning to go snorkeling and probably have eyesight issues, then you should seriously consider getting one of these special masks. These masks come in different corrective grades for both nearsighted and farsighted individuals. The three common types are bonded corrective lenses, custom prescription lenses, and drop in lens masks. Let’s take a quick look at each type. This is a cheaper variation of prescription dive masks. It comes with the corrective lens placed inside the actual dive mask lens. The lens is bonded perfectly to the basic mask lens to give you perfect eyesight underwater. This type of mask is inexpensive but is heavier than the other types. It is also not recommended for people with strong glass prescriptions and astigmatism. You’ll also need to know your glasses prescription before you purchase a bonded corrective lens mask to avoid usage problems in the future. You can have a custom snorkel mask made for you simply by replacing the mask lens with glasses that suit your prescription. This type of personalized mask is more expensive than a bonded lens but is usually the best option for anyone with strong glasses prescription. It is lighter and provides users with a clear full view of the breathtaking underwater scenery. Drop-in lens masks provide the most convenient and versatile option. They allow you to remove and easily drop-in your pre-made corrected lens at will. You can consider them as easy to use masks for different types of lenses. Take note, however, that if you use strong glasses or have astigmatism, the drop-in lens may not work perfectly for you. It is highly recommended to have your vision checked and ensure that your prescription is accurate before you buy any type of prescription dive mask. Before you buy an optical mask for your diving pleasure, here are a few things that you may need to take note of. You obviously want a mask that helps you to see clearly underwater so make sure to buy one with corrective lenses. The type of lenses you go for will depend on your prescription. Take note though that the lens will not exactly match your prescription but ensure they are as close to your prescription as possible. Lenses are available in increments of half or whole numbers. For example, they may come as -2.0 or -5.5 so if you have a prescription of say -5.25, you can either go a bit higher or lower. Guess what, it’s not just about lenses. Remember that even if the lenses are perfect, you need a mask that fits you well. For instance, if your budget allows it, buy one with silicone skirting rather than PVC. Silicone skirting provides better sealing and is more comfortable than PVC skirting. PVC is a cheaper option but can easily crack, allow water to seep inside the mask, and generally wears out faster. Another important thing to consider is the quality of the strap and quick release clips. The clips should be able to hold the strap properly in the right place while you move around in the water. Make sure the clips don’t accidentally release the straps and let in water. Does a more expensive prescription mask necessarily mean better quality? It does but not always. When thinking of cost-effectiveness, ask yourself how often you’ll be using the snorkeling mask and precisely how much you can spend on the product. You could go for a less expensive mask if you snorkel just a few times each year but if you an avid diver looking for a high-quality mask, then, by all means, go for the best prescription snorkel mask on the market, regardless of price. You could also start with a cheaper mask and upgrade to a more expensive model if you find yourself diving more often. However, you don’t have to compromise quality just to cut corners in your budget. Go for the best mask that you can afford. So how do you find the best prescription snorkel mask in a market full of confusing products? Well, we took the trouble to research and list the top ten prescription diving masks on the market to make life a bit easier for you. We selected the products reviewed below based on a number of factors. The first consideration was the number of lenses available for use with the mask and if you can attach corrective lenses to it. The second consideration was the comfort factor where we looked at the materials used to construct the mask’s frame and its skirt design. You obviously want a mask that fits comfortably. We also considered each mask’s strap adjustability. This is an important factor to consider especially for folks who are not sure of their head sizes. You’d want a mask with a strap that can be adjusted to fit your head perfectly. Here is a list of our top ten prescription snorkel masks. Take a look and find one that suits your needs and other personal preferences. The Promate Full Face mask from GetWetStore is innovatively designed for nearsighted snorkeling fans. It’s also a great option for beginners who prefer not to use the usual tube snorkel for fear of getting a sore jaw or suffering gag reflex. With this best fitting prescription snorkel mask, you don’t need to suffer the discomfort of sticking a tube in your mouth. It gives you a completely new snorkel experience. The mask comes with Rx lenses made of tempered glass. You can get it for -1.5 to -6.0 lenses with increments of 0.5 depending on your prescription. It covers a wide range of lens sizes to suit your personal preferences. Has an innovative design that allows you to breathe freely underwater via your mouth or nose. The mask has breathing chambers inside designed to let you breathe naturally. It has physical anti-fog technology that ensures water does not seep into the breathing tube. This helps to keep the mask dry and reduce fogging that would otherwise interfere with your underwater vision. To give you a firm and comfortable fit, the mask has a combination of silica gel and plastic. It also comes with an adjustable strap for different head sizes. The silica gel design and an adjustable strap allow you to explore the underwater world in comfort. Has a large viewing area to give you an unhindered view of the wonders of the marine world. Your vision is not limited to a small viewing area. It doesn’t come with a case but you can always use a case from an older mask if you have one. The Promate Full Face mask is a perfect choice for snorkeling lovers who happen to be shortsighted. It comes with a wide range of lenses and is designed with comfort in mind. The Promate Optical Corrective Scuba Diving Mask is a best-budget pick. It comes at an affordable price while retaining most of the features you find in higher priced prescription snorkel masks. It comes in a variety of colors to choose from and lots of optical correction lens options. Its low volume design and light weight make it an easy to use the mask. A wide range of optical correction lenses starting from -1.0 to -10.0 with 0.5 increments. There is an option for just about every type of prescription lens. Lenses available for both nearsighted and farsighted people. There are even bifocal sizes too. You can buy this prescription dive mask’s bifocal sized lenses with confidence that it will fit your eyesight prescription. The prescription dive mask bifocal lenses are made of Toughened or tempered glass manufactured with controlled thermal and chemical treatment to make it stronger than normal glass. You are assured that the glass will not break easily and will last long. The tempered glass lens doesn’t scratch easily too. It comes at an affordable price, which makes it an economical solution for both nearsighted and farsighted snorkeling lovers. Has a comfortable strap made of hypoallergenic liquid silicone materials. No more strap marks across your face when you remove the mask after the dive. A few users with narrow faces claim in some prescription dive mask reviews that it doesn’t fit perfectly but you can always adjust the strap for a firmer and more comfortable fit. At its price point, Promate Optical Corrective Mask is a budget-friendly prescription snorkel mask. It has most of the key features in other higher priced masks. This is a versatile mask that’s available in different sizes and shapes. It is designed to fit perfectly into different facial types. The mask is lightweight and comes with swiveling easily adjustable buckles to give you a firm and comfortable fit. It has a low-level twin lens design that allows you to enjoy your snorkel or scuba diving activities for an extended period of time. It’s the first dive mask featuring Cressi’s patented technology of inclined glasses. The lenses can even be interchanged should your prescription change in the course of time. The mask’s skirt has hypoallergenic silicone with a double feathered edge seal. The materials are not only lightweight but provide a comfortable fit too. It has a low volume design with minimum eye-lens distance. This ensures that you get a field of vision in every direction. Has swiveling adjustable buckles that provide instant adjustment for a firm yet comfortable fit. It is a soft secure leak-proof mask. You won’t have to worry about water getting inside the mask because it fits perfectly. You can install graduated optical lenses. The mask is available with a wide range of corrective or mirrored lenses to suit people with different prescriptions. It is lightweight and perfect for your snorkeling or diving vacations. Comes with tempered glass lens. You can even order as per your personal prescription. They don’t come with instructions on how you can change the lens but it is actually an easy process that you can figure out in a short time. This is a versatile mask designed to fit different face shapes. It has a comfortable leak-proof skirt that eliminates the problem of fogging. Its lens can be interchanged which makes it an ideal choice for both nearsighted and farsighted divers. The Scuba Blue Farsighted Prescription Mask is available in a wide range of corrective lenses to suit farsighted scuba diving and snorkeling enthusiasts. You can use it for any type of underwater activities despite being farsighted. It has a high-quality build that ensures your scuba diving or snorkeling is not marred by blurred vision or fogging. Corrective lenses available range from +1.0 to +4.0 with 0.5 increments. This ensures that there is a suitable lens option for most farsighted people. It has an innovatively designed facial skirt made of silicone. The face skirt easily adapts to your face shape to give you a secure and comfortable fit. Unique buckle design that allows you to adjust the mask on the fly. The lenses are made of strong and durable tempered glass material. You won’t need to replace the mask anytime soon. You can only replace the lenses if your prescription changes. A perfect seal that doesn’t leak or allow fogging. It gives you wide clear views of the marine world. A wide range of lenses to choose from. Good price. Need we say more? You need to test it with the regulator in your mouth to ensure it fits perfectly, especially if you have a smaller nose but otherwise it fits securely and comfortably. If you are in the market for a leak-proof prescription mask for farsighted individuals, then the Scuba Blue Dive mask is a perfect choice for you. It comes at a good price too. The Scuba Choice Nearsighted Prescription Snorkel Mask comes in a wide range of corrective lenses from -1.0 to -10.0 with 0.5 increments n between. It has other useful features such as a silicone skirt, tempered glass lenses, and a unique buckle design for its adjustable strap. The prescription mask is designed for nearsighted scuba diving and snorkeling fans. It comes with a wide range of corrective lenses for nearsighted people. You’ll definitely find one that perfectly suits your prescription and enjoy the marvelous sights of the water world. The lenses are made of strong and durable tempered glass. The toughened glass does not scratch easily. You’ll only replace the lens if your prescription changes in the course of time. Its facial skirt and strap are made off crystal silicone to keep you comfortable and ensure that water does not leak inside the mask. It has a unique buckle design for the adjustable strap that makes it easy to wear or take off the mask. It has a comfortable and tight-fitting build that doesn’t leak easily. Its panoramic style gives you a better line of vision underwater. Enjoy clear views while snorkeling or scuba diving. Comes with a wide range of corrective lens sizes for nearsighted scuba diving and snorkeling enthusiasts. You may need to treat it with an anti-fog solution to enjoy even more perfect views underwater. If you are a nearsighted fan of scuba diving or snorkeling who won’t let poor vision prevent you from enjoying the great aquatic views, this is a perfect prescription snorkel mask for you. It is specifically designed for nearsighted users. The IST M80 2 Lens is a durable prescription scuba diving and snorkeling mask designed for people with eyesight problems. It has a great design that fits on different face shapes and sizes. The prescription mask comes in a range of lens grade options to suit both nearsighted and farsighted users. Its professional low profile design provides wide-angle views and a bigger internal volume. It has a silicone 100% hypoallergenic skirt, a comfortable edge seal, and low volume design. The skirt has a feathered edge seal that gives you a snug comfortable fit. You won’t feel any discomfort after using the mask for an extended period of time. It provides a wide range of prescription lenses. You can purchase diopters separately from -1.0 to -8.0 or +1.0 to +4.0 with 0.5 increments. The mask is designed for use by both nearsighted and farsighted individuals. Both left and right lenses are interchangeable. It is a versatile prescription underwater mask designed to suit different vision prescriptions. It has swiveling buckles for the adjustable strap. You can easily use the rotating buckle to adjust the strap to your preferred angle fast and easy. Scared of suffering a head squeeze while diving? Not with this mask. It comes with a wide split strap that distributes pressure on a wider surface area to prevent an uncomfortable head squeeze. It is also available in a wide range of colors to suit your personal taste. Colors range from clear blue, and bright yellow to carbon fiber checked pattern and all-black. The lenses are made of shatterproof tempered glass for strength and durability. They even have a teardrop shape that gives you a panoramic view of the underwater world. A few users claim they are a bit small in size. The IST M80 2 Lens low profile prescription mask is a great choice for both nearsighted and farsighted individuals who love scuba diving and snorkeling. It has a comfortable design that can fit different face shapes and sizes. The Promate Dry Snorkel is a slim, 2 window low profile prescription snorkel mask that comes with built-in purge and a useful channel at the bottom that directs bubbles away from view to give you clear vision in water. It has an easy to adjust buckle and a host of other features designed to give you the best snorkel experience ever. Comes with an adjustable buckle attached to the skirt. The swivel buckle is flexible enough to fit different face shapes and sizes. It has softly shaped dimples on each side of the nose packet which provide easy equalization and normal breathing. The strap and skirt are made of comfortable and durable silicone material. It has a one-way purge valve removes air and excess water from the mask. Has a colored Promate Cobra Dry whistle. The whistle is especially useful for attracting attention when need be. Has an easy to adjust buckle that gives you a secure and comfortable fit. It does not have a carrying case or bag. If you are looking for a high-end dry snorkel prescription mask, then get the Promate Dry Snorkel combo set. The prescription dive mask with purge valve comes with all the high-end features you need in a premium prescription mask. The Promate Deluxe Gear Snorkel Set is actually a full set of snorkeling equipment. It consists of a dry snorkel tube, diving fins, a prescription snorkel mask, and a nylon mesh bag with a cord drawstring to hold your items securely. It is a complete set of everything you need to enjoy your snorkeling experience. Swiveling buckle designed for easy strap adjustment and comfort. You won’t feel squeezed inside this mask. Low profile design and an extremely thin frame. You won’t feel like you are carrying any weight on your head while enjoying your snorkel adventures. Whistle snorkel made of high-quality materials. It has a dry build and design for durability. Snorkel fins that can be used either barefoot or with neoprene socks. The fins fit different foot sizes for fluid underwater swimming. Tempered glass lens that is shatter-proof, scratch-proof, and quite durable. Snorkel bag with a drawstring cord to keep everything safe and intact. Silicone purge valve that helps to drain the prescription snorkel gear. This is a complete prescription set designed to enrich your snorkeling experience. It has a professional look but can be used by both beginner and advanced divers. Available in beautiful ocean blue color, the YEESAM SWIM Diving Prescription Mask is designed for people with nearsighted visual problems as well as those suffering from myopia. It allows people with nearsighted and myopia conditions to get a clear view of the ocean while scuba diving or snorkeling. It’s made of high-quality transparent silicone materials that keep your nose and other parts safe and secure while exploring the marvels of the underwater world. Corrective lenses that can be customized to suit your personal prescription. It is a versatile prescription mask that gives nearsighted users a wide clear view of the ocean life. A 100% hypoallergenic silicone skirt that feels securely tight and comfortable on your face. You can order for different prescription lenses for each eye if you use different corrective lenses for each of your eyes. Made for nearsighted people only. Would be great if they had a version for farsighted users. This is a perfect prescription snorkeling mask for nearsighted people. It comes with premium features, has a comfortable design, and can be used with a wide range of lens grades. The Maui diving and snorkeling mask with optical corrective lenses are designed for comfort and wide clear views while exploring the magnificent fauna and flora of the underwater environment. It is also a great snorkeling mask for kids who want to see ocean creatures and plants without using glasses and contact lenses. It has a double feathered silicone skirt that comfortably holds your nose and faces contours. Its tempered glass lenses are shatterproof and scratch resistant. You can depend on the toughened glass to keep your eyes safe from accidents while enjoying your snorkel adventures. Available in 8 beautiful colors including black, blue, pink, red, yellow-white, neon orange, and neon green. It works perfectly with Deep Blue Gear corrective optical lenses which are sold separately. Has a stainless steel roller pin buckle that makes it easy to adjust the mask strap. The skirt feels a bit tight for people with wide faces but you can always adjust the strap for a perfect fit. The Maui Deep Blue diving and snorkeling mask is a great option for family snorkeling vacations. It can be used by adults and kids. It has an easily adjustable design, durable tempered glass lenses, and is compatible with Deep Blue Gear optical corrective lenses. Q. Can I get a mask with different lenses for each eye? A. Yes, you can get different lens sizes for each eye. However, you need to be specific and correct while placing your order because if you provide wrong or inaccurate information, most companies will not provide a refund for the customized prescription lens. Q. Can I replace prescription mask lenses on my own? A. You can but make sure you understand how to replace lenses in the right way to ensure that the mask is sealed properly. Q. When choosing lens sizes, do you recommend going higher or lower on the sizes? A. Lens sizes for most prescription masks have 0.5 or half size increments. For instance, if you are 5.25, you have a choice of either going for 5.0 o 5.5. The best option is to go lower than your actual prescription. A prescription that is too high can cause headaches or eye strain. Your choice will depend on many factors besides your budget. You’ll need to choose a mask that suits your eyesight condition. If you are nearsighted go for an appropriate prescription mask with optical corrective lenses for nearsighted people. All the prescription masks covered here are made of high-quality hypoallergenic silicone skirts, feature adjustable straps, and great buckle designs among other useful features. They are all designed to give you a comfortable fit and clear views of the ocean world while scuba diving or snorkeling. 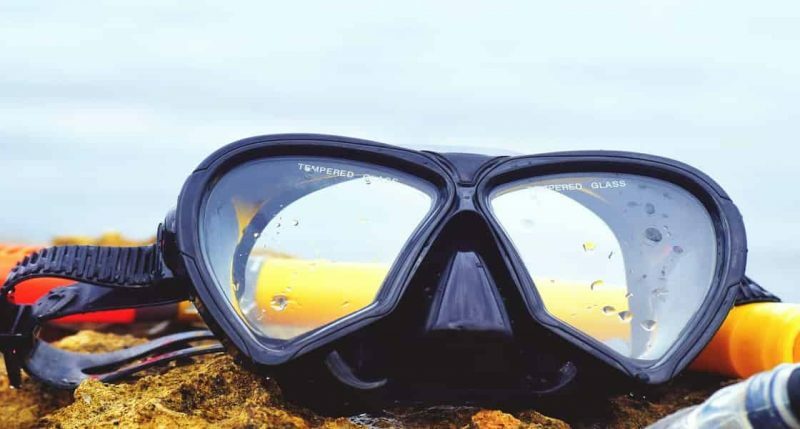 Feel free to choose your best prescription snorkel mask from our top ten picks according to your eyesight condition, style preference, and budget.